The Miami Hurricanes men’s basketball team defeated the No. 18 Virginia Cavaliers 54-48 in overtime Monday in Charlottesville, Va.
Miami guard Bruce Brown hit a three-pointer with 23.8 seconds remaining in the extra period that put the ‘Canes up for good at 50-48. It was a grown-man shot by a confident freshman with a defender in his grill. A pair of free-throws made by Davon Reed and D.J. Vasiljevic iced any chance of a Cavalier comeback. Coach Jim Larrañaga’s seven-man lineup displayed a gritty performance against Virginia’s ten available men, and in the process secured a key victory in Miami’s quest for a second-straight NCAA tournament appearance. 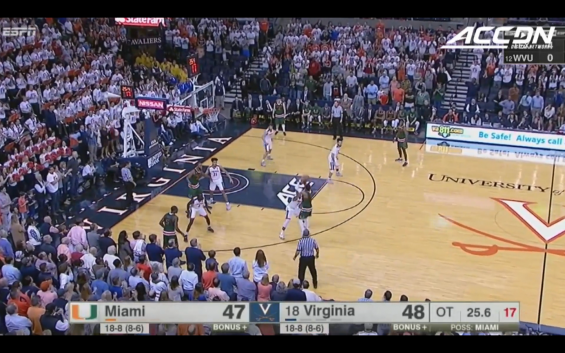 Conversely, the ‘Canes were one basket away from leaving Virginia with an ugly loss. We know this game was one of two things. It might’ve been the kind of smash mouth performance that bodes well heading in to tournament play. Or maybe it was a highlight of the deficiencies Miami has that makes a March run unlikely. Time will tell. But here are some stats that point in the ugly direction. Vasiljevic was the only ‘Cane to hit multiple three’s, with two. Reed, who has been how from three-point range for almost a month now, was an unsightly 1-7 from downtown. His first attempt was a step-back that didn’t come close. Throughout the game Reed was seen tying his shoes on the court, and at one point he even committed a turnover by dribbling the ball off his foot. Best to leave those kicks on the shelf for next time. Brown’s only make from deep happened to be the game-winner. Timing counts for something. Guard Anthony Lawrence, Jr. was the only other Miami player to attempt a three and he went 0-3. On the positive side, the ‘Canes were able to penetrate the paint and draw fouls. Brown, in particular, converted nine of his game-high 10 free-throw attempts. Reed, Vasiljevic and Lawrence, Jr. were all perfect from the stripe as Miami combined to go 20-22 on free-throws. Miami forward Kamari ‘Midrange’ Murphy came fresh off his career-high 15-point outing against Clemson to score 10 points. Murphy has made teams pay over the last several games with midrange jumpers. Against Virginia it was no different, even showing off a silky turnaround jay to help the ‘Canes pull out of a first half shooting slump. According to ESPN Stats and Information, the two teams combined for 108 points, tied for the 2nd-lowest total between major-conference teams this season. That stat was highlighted by a minutes long scoring break for both teams midway through the first half. Miami went just over six minutes without scoring while Virginia went over seven and a half minutes without a field goal. The last 1:20 of game action was interesting, to say the least. Two late-game blocks by Murphy and Lawrence, Jr. were erroneously called fouls. Virginia’s Mamadi Diakite missed the first two on some “ball don’t lie” karma, which would’ve put he Cavaliers up five. Instead, with the Cavaliers only up two, Vasiljevic came down the court and hit a game-tying three-pointer. On the ensuing possession, Brown jumped in front of a pass by Virginia’s London Perrantes before being fouled. Brown hit two free-throws to put Miami up 43-41 with 27 seconds remaining. With four seconds left, Lawrence, Jr. was called for a foul. Replays showed him getting the ball on his block attempt, with any contact falling under the foul-threshold (at least in the eye’s of this reporter). Virginia’s Isaiah Wilkins made two shots to send the game into overtime. But not without a little more drama first. Reed hit what seemed to be a game-winning three after receiving the ensuing inbound pass. Replays, however, showed the ball was still in his hands as the buzzer sounded. Brown, who only made one other field goal aside from his game-winner, finished with a team-high 14 points. The ‘Canes overcame 15 turnovers in their win. They look ahead to No. 10 Duke, who they will play Saturday afternoon at Watsco. Center in Coral Gables, Fla. Tip-off is set for 4 p.m. with the game broadcast nationally on CBS.